Century Cycles Blog: Bicycles in books: "Traffic" and "The Last Lecture"
Bicycles in books: "Traffic" and "The Last Lecture"
You're a cyclist, and most likely a driver, so do yourself a favor and pick up Traffic: Why We Drive the Way We Do (and What It Says About Us). 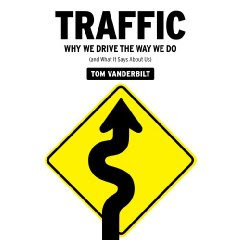 Between pondering why traffic jams form and why such delays cause more stress than other facets of life, author Tom Vanderbilt presents a sobering concept: that drivers often register cyclists as merely one more bit of road clutter to avoid, if they see us at all. To top it off, the speed at which we travel -- faster than a pedestrian, slower than a car -- can distort the driver's sense of perception. There's no simple way to make the streets safer for cyclists, except for everyone on the road to pay more attention. But for now, read the book. It will make you a more aware driver, and a better cyclist. This book is a way for me to continue what I began on stage. Because time is precious, and I want to spend all that I can with my kids, I asked Jeffrey Zaslow for help. Each day, I ride my bike around my neighborhood, getting exercise crucial for my health. On fifty-three long bike rides, I spoke to Jeff on my cell-phone headset. He then spent countless hours helping to turn my stories -- I suppose we could call them fifty-three "lectures" -- into the book that follows.